Riverfront Center on Oct. 4, 2012. 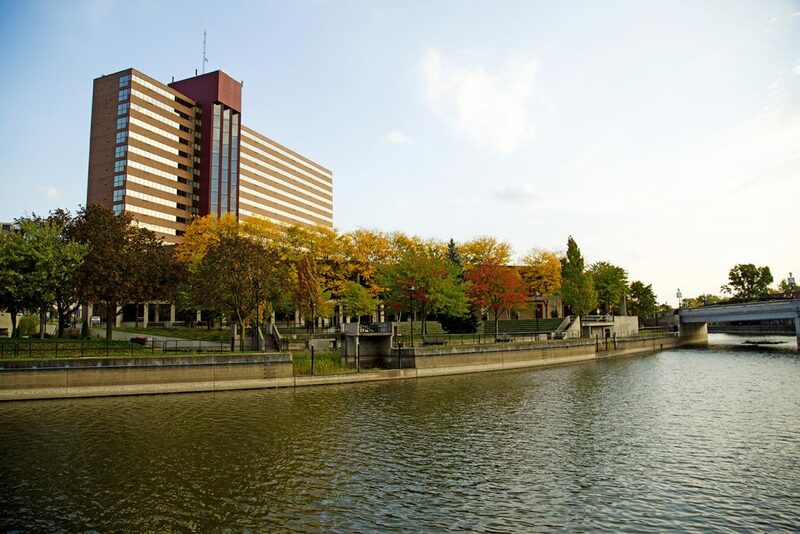 The School of Management, established in 1975, is the oldest professional school on the Flint campus, and occupies more than 27,000 square feet of recently renovated Riverfront Center. Our facilities are technology rich and include a finance lab with interactive investment and stock trend displays, 24 hour computer labs, a video recording classroom, a video conference classroom that allows for live joint-classes to be held with partnering international institutions, and private meeting rooms for students to study and work on group projects outside the classroom. The School of Management employs a number of dedicated, full-time academic advisors and staff to assist our students in a number of ways. Because your success before and after graduation is of the utmost importance to us, the school’s professional staff present a number of professional preparedness workshops and industry networking events throughout the academic year. Our professional staff also provide services to our students with scheduling and curriculum advising, assistance in academic matter appeals, notifications about internships and job openings in various business fields, and information on tutoring. The school is accredited by the Association to Advance Collegiate Schools of Business. AACSB International accreditation is the hallmark of excellence in management education. We deliver our programs to a diverse group of graduate and undergraduate students primarily in Michigan and the surrounding region using a variety of learning/teaching approaches that focus on skills, abilities, technology and knowledge vital to organizations. There are also a number of scholarships given exclusively to business students.